This 1700’s colonial home had been completely restored over 30 years but without a garden. A new garage was sited to help create a courtyard within close proximity to the guest entrance of the home. Hand cut salvaged fieldstone was used for the edging and paving in keeping with the vernacular of the period. A new upper retaining wall was built to mimic the original walls and to support a terrace with access from the kitchen and with borrowed views of a stream to the south. 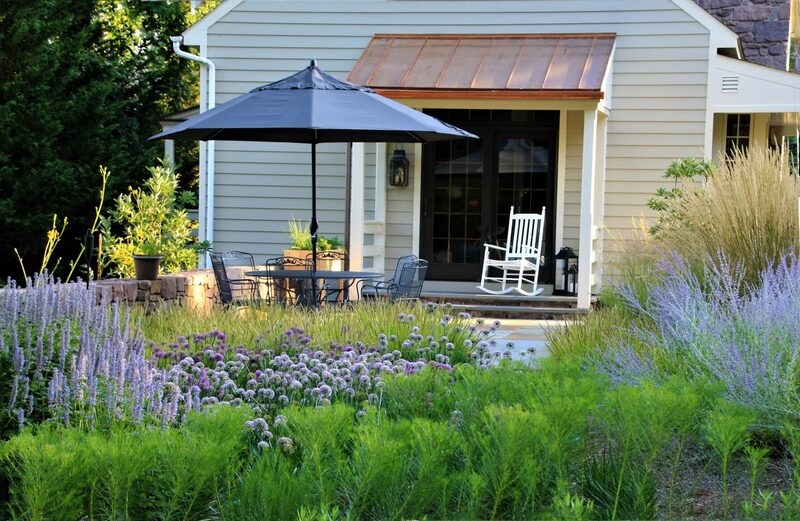 Native plants and cosmopolitan plants alike were used to evoke the regional landscape. Plantings were established to define and entice circulation of the garden, manage rain water, and immerse guests in artfully defined compositions of plantings that have been described by the owner as “walking through a symphony”. Two species of native Symphytum and two species of native Liatris were added to the compositions in anticipation of generating some hybridization on site, adding to the excitement and long term viability of the garden. In thinking about our work and what I think is important, which is to strive for creating places that one can have a visceral reaction to, this garden’s plantings define circulation in ways that clearly entice guest to explore and experience the landscape. Plantings were beautifully successful in blurring lines to the beyond and offering new views and compositions just around the corner.